One Fat Frog Restaurant Equipment just got in a fantastic used Taylor soft serve machine. This is a single phase model. To properly maintain your soft serve machine, clean condensers on air-cooled units at least once a month to eliminate buildup of dust, lint, and debris. Water-cooled units require the water to be checked regularly. It is important to regularly change ice cream machine scraper blades. Faulty scraper blades on soft serve machines will leave a film of frozen product on the unit’s cylinder walls. 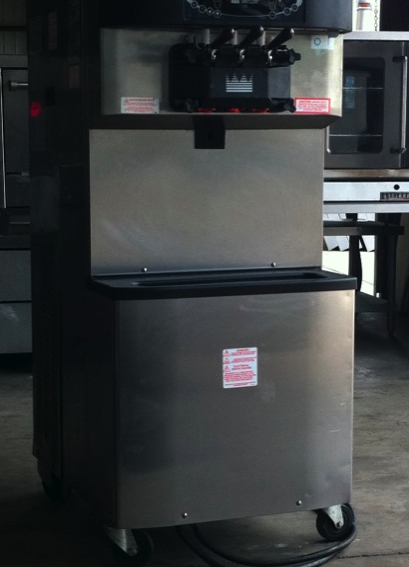 One Fat Frog Restaurant Equipment offers an easy financing plan that can get you all of the used commercial equipment you need – including used soft serve machines. No matter what condition your credit is in, One Fat Frog Restaurant Equipment can get you approved! Whether you already have your own restaurant or are just starting out, One Fat Frog Restaurant Equipment wants to finance you!